The 2012 NUWAY National Wrestling Duals were held in Battle Creek, MI on Sunday February 12, 2012. There were 32 teams in four different age groups, competing for the NUWAY National Team Champion title. Teams came from all over the nation, from as far Pennsylvania, North Carolina and California to compete. Four of the wrestlers who were sent to represent Team Michigan were from the Cedar Springs Youth Wrestling Club, one in each age group. Landon Demorest and Jordan Ringler both made the MYWAY Red Teams. Landon, who went 4-1 with 3 pins, wrestled on the MYWAY U8 Red team, which placed 5th over all. Jordan, who went 2-2 with 1 pin, wrestled for the MYWAY U14 Red Team which placed 7th overall. Ryan Ringler and George Gonzales Jr. both made the MYWAY Blue teams. 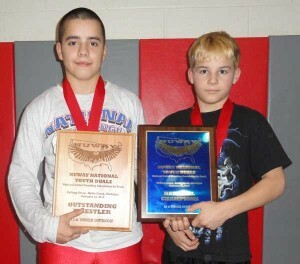 Ryan, who was on MYWAY U10 Blue team, was the only undefeated wrestler in the 95lb weight class. He went 6-0 with 3 pins. His team took the championship in U10 division. George Gonzales Jr, who was on the U12 MYWAY Blue team, also went undefeated in the 140lb weight class, but was the only wrestler in his weight class to pin all of his opponents. He defeated Jalen Lesane from North Carolina, who was 40-0, with a pin in the third period. George was also awarded the Oustanding Wrestler Award in the U12 division for having 5 pins in an accumulative time of 4:55. His team also took the championship in the U12 division. Overall, Team Michigan Blue took championships in each age group.